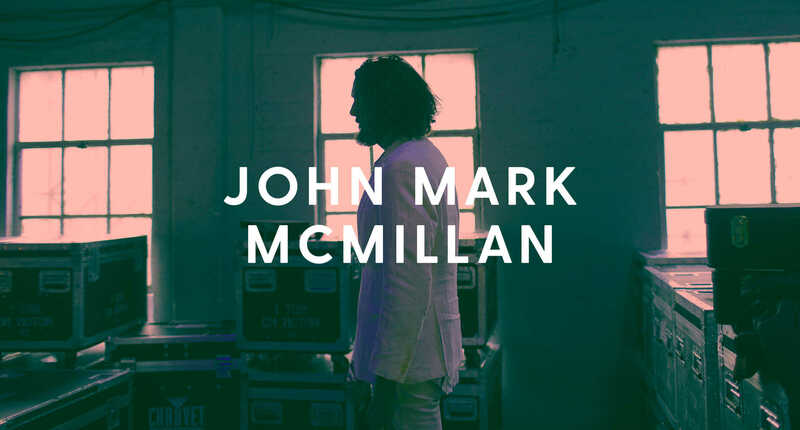 When John Mark McMillan sat down to work on the album that would become Mercury & Lightning, he thought he was going to be writing a worship album. Instead, something different happened. If you’re familiar with McMillan’s catalog, that may seem like an odd statement. After all, for the last 10 years, his mega-hit “How He Loves Us” has been a staple of contemporary worship services and Christian radio, and has been covered by the likes of David Crowder, Kim Walker-Smith, Todd Agnew, Flyleaf and countless others. But when McMillan started writing songs for the new album, he realized “worship” music—at least in the sense that many Christians think of it—didn’t feel honest. “I had a little bit of a crisis of faith during recording this record,” he says. He wanted to express the actual thoughts and emotions he was experiencing, and in the moment, the kinds of songs many people think of as worship just didn’t fully represent how he was feeling or thinking. The moment led to a revelation. What if he ignored preconceived notions about “worship”—as dictated by the kinds of music that is typically marketed as “praise and worship”—and just wrote something that felt real, vulnerable … dangerous? Instead of embracing basic platitudes about God, he was going to embrace all of the questions he was facing. The resulting record isn’t just McMillan’s strongest to date; it’s an exploration of questions—and a challenge to how we see worship in the first place. McMillan’s big epiphany about what’s wrong with modern worship hit him following a somewhat unlikely moment—he was frustrated while Bible shopping. Lately, he’s been doing a lot of preaching at his home church in North Carolina, and decided he needed a new Bible, one with big enough print for him to read while standing and speaking from the pulpit. All of the ESV Bibles—his translation of choice—had a cool look to their design, binding and covers. They were Bibles that fit his personal style. After picking one out, he decided to get another translation as well. That’s when he noticed something that would go on to challenge a lot of the ways he views worship and even faith: He didn’t like the way any of the other translations looked. Somewhere, in a marketing meeting, someone decided that certain translations would be appealing to certain types of people. People—depending on their age, background and denomination—like different design styles. But in this case, commerce was directly affecting spirituality. He realized this kind of marketing and commerce-driven strategy—making products that affirm what people want rather than challenge it—just creates a spiritual echo chamber. The same concept applies to worship music, he says. “All of a sudden there’s a lot of money in worship music,” and there are also consequences. He’s grateful that worship music is popular, but that popularity might also have spiritual repercussions. “It makes you wonder like, ‘If you know a certain song is going to do better because it says a certain thing, but you kind of would rather say it a different way, but you’re going to say it this way because you know it’s going to do better, what does that do to our spirituality?” he wonders. In other words, are worship artists pressured to write songs that will sell instead of ones that are honest about their doubts and fears? It’s a question that directly affected his latest album. There’s a psychological phenomena that researchers call “confirmation bias.” The idea is that people tend to favor and seek out information that will affirm their pre-existing values. Inherently, most people would rather be told they are right than proven wrong. If one isn’t careful, confirmation bias can create distorted imbalances in the media they choose to consume, in the personal advice they agree to accept and in almost every part of day-to-day life that involves making any sort of value judgment. And it might also be affecting how we worship God. On Mercury & Lightning, McMillan seems more interested in challenging big ideas than simply putting a soundtrack to them. In order to create something new, he decided to abandon other people’s expectations, even if it affected how the record would be received. “It’s funny, you want to separate commerce and art, and you want to separate commerce and your opinion about things, but it’s really interesting how beneath the surface, it influences the way we think almost on a fundamental level no matter who we are,” he says. When McMillan sat down to write Mercury & Lightning, he realized he had a decision to make: Write what he knows people will want to hear, or take a risk, and deal with his crisis of faith head on. Mercury & Lightning doesn’t have a lot of the kinds of songs you’ll likely hear in Sunday morning services, but that doesn’t make it less worshipful. His approach isn’t jaded or cynical—instead it’s decidedly honest, even if the honesty doesn’t lead to easy conclusions. Ultimately, he’s hoping that when people hear songs that ask questions about God and the Church—instead of simply repeating things the Bible says—they’ll be encouraged by the transparency of hearing someone else ask questions and come out on the other side with their faith intact. Being that inspiration, in and of itself, he explains, is its own kind of worship. “There’s definitely a worshipful conversation throughout the record,” he says. However, he contends, “There’s one song on the album that I think people would consider to be a worship song,” referring to the album’s closing track, “Nothing Stands Between Us.” But even for a “worship” song, there’s something different about it. After a big chorus in which McMillan sings, Nothing stands between us, oh / Nothing stands between us but love now, the music builds to a crescendo, and he sings, Have I tried to scale Your walls in vain? / To cross Your seas, I pushed against Your waves. / What for all the miles have You to say? / Were You there beside me this whole way? It’s an open-ended question. And though the “answer” may not be clear—it’s a question he’s comfortable asking, because he’s realized worship isn’t just certainty; it’s faith in a God that’s comfortable with questions, even in our worship of Him.